While 2017 was a good year for heavyweight prospect Jared Vanderaa personally with the birth of his daughter in April, professionally it was a less productive year. After suffering a loss to Richard Odoms in June, Vanderaa was able to rebound in August against Idress Wasi, before closing out the year with a second loss in two bouts against Andrew van Zyl in December. “It is disappointing, but it shows that there were holes in my game that I needed to work on,” Vanderaa told MMAWeekly.com. “For example, in Richard’s fight, the game plan we had going into it didn’t favor my cardio in a lot of ways. You have to take those losses and learn and better yourself. 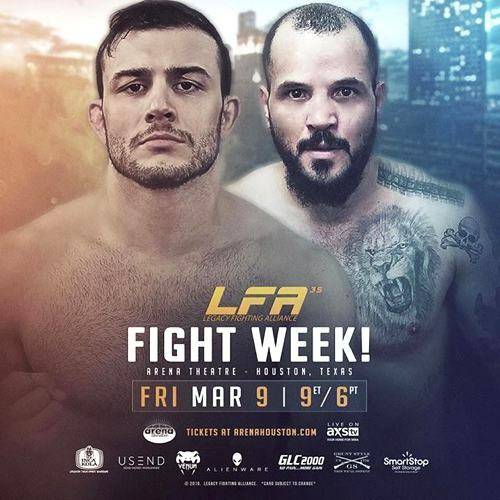 For his first fight of 2018, Vanderaa (6-2) steps into a late-notice fight against Vernon Lewis (4-3) on Friday in Houston, Texas, in a heavyweight main card bout at LFA 35. “I wanted the fight because I was trying to get on an LFA card later in the month, but the guy they offered me didn’t want to fight me,” said Vanderaa. “I got a call from another promotion, but that guy didn’t want to fight. And the next day I got a call for this fight and took it. I was already preparing for this fight, even though I didn’t know I was going to have this fight. Looking to rebound in 2018, will accept nothing less than having a stellar year to get his career back on track and headed towards the next level of MMA.